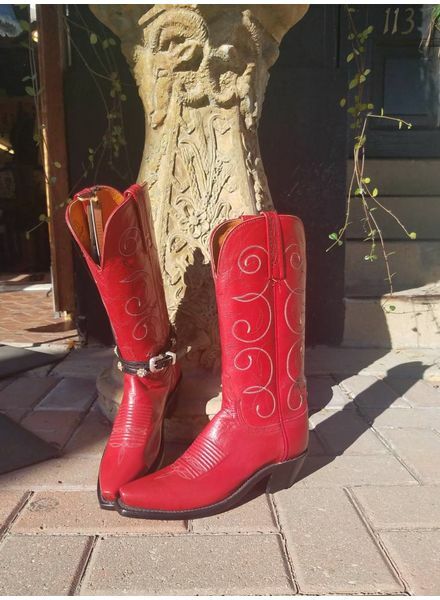 EXCLUSIVELY FOR ORISONS - ORISONS "WE DRESS TEXAS"
LUCCHESE EXCLUSIVE FOR ORISONS the "TEXAS RED"
MADE EXCLUSIVELY FOR ORISONS BY LUCCHESE THE "TEXAS RED" COWGIRL BOOT FEATURES BEAUTIFUL SOFT RED GOAT LEATHER. ADD A BOOT BRACELET FOR SOME EXTRA SPARKLE AND GET READY TO SHINE!!! !